Congratulations to the first students to get their PhDs from the lab! Karl Lundquist, Anthony Hazel, Sunny Hwang, and Curtis Balusek all defended their PhDs at the end of last semester. 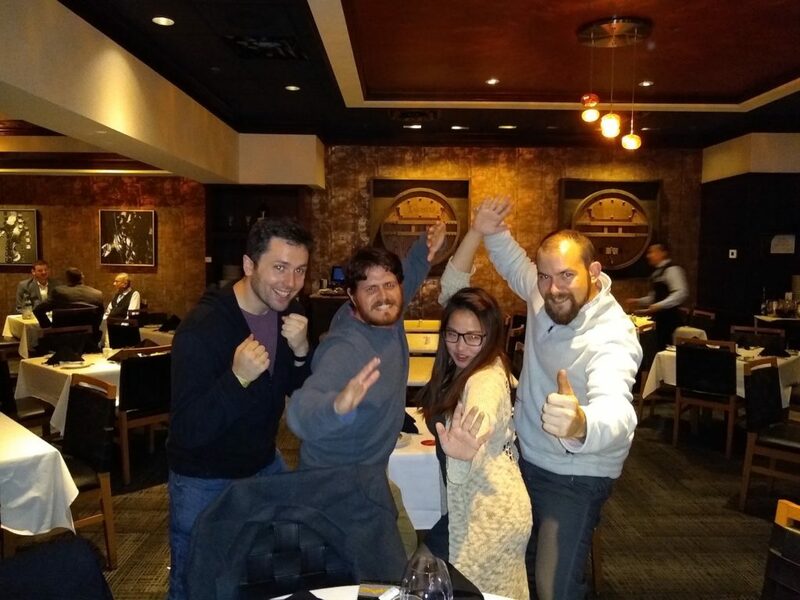 While Karl is sticking around for a couple months to finish up some projects, Anthony is already moving on to a postdoc with Alex MacKerell at U. Maryland, Sunny is going to do a postdoc in Emad Tajkhorshid’s lab at UIUC, and Curtis is starting a new career at Axis Group. We wish them all the best of luck! Karl, Anthony, Sunny, and Curtis together for a last meal as group members. 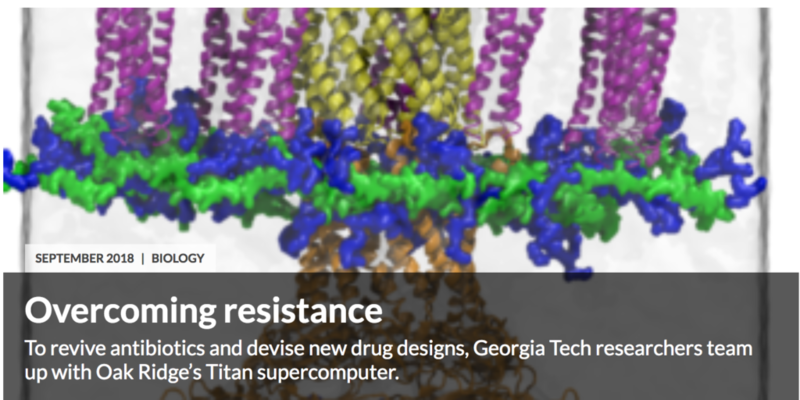 A recent story in ASCR Discovery highlights Anthony’s work using petascale simulations on the supercomputer Titan to understand antibiotic efflux in Gram-negative bacteria. JC and Anthony (along with Chris Chipot, UIUC and Edina Rosta, King’s College) just completed a 5-day NAMD/VMD workshop in Dalian China at the Dalian Institute of Chemical Physics, hosted by Guohui Li. In addition to all the great science discussed and tutorials completed, they also ate some great food and took in the sights. Hopefully this is the first of many there! The first ComSciCon Atlanta was held last week on the Georgia Tech campus. ComSciCon aims to help other graduate students learn novel ways of communicating science to other scientists and to the public. JC and graduate student Curtis Balusek (pictured) presented on VMD Lite as an example of conveying complex dynamical information about biomolecules in an easy-to-understand and visually appealing manner. See more examples of our outreach efforts here. A joint study led by Raquel Lieberman in the School of Chemistry and Biochemistry at GT revealed both the structure and stabilizing mechanisms of the protein myocilin, which is present in the trabecular meshwork of the eye. 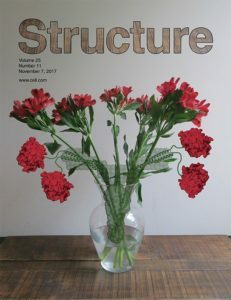 In particular, simulations demonstrated the role of a key disulfide bond in resisting unfolding. See more about the story here and the paper here.